The M18 platform first arrived 10 years ago, in 2008. Since then, Milwaukee has been committed to making it the most comprehensive platform on the market. The big news out of NPS 2018 was the release of their supercharged M18 12.0Ah battery, which promises longer runtimes and increased performance. The battery promises to provide 50% more power, run 50% cooler, and provide 33% more runtime versus their previous most powerful battery, the HD9.0. Milwaukee achieved this by upgrading their battery cells to the new 21700 cells. An M18 Redlithium High Output XC6.0Ah battery was also announced, promising 50% more power, 50% cooler running temperatures, and 20% more runtime versus their M18 XC5.0 battery. To go along with the new battery release, the manufacturer also announced the release of several tools that have been optimized for use with the new battery, including a table saw, a Super Sawzall, a 16” chainsaw, a 1” impact wrench, the world’s first 18V large angle grinder, and a new 7 ¼” circular saw. Most of these new tools, which promise corded 15A power, are available for preorder on Toolbarn.com right now. With the release of the physically larger 12.0Ah battery comes physical compatibility issues with some of Milwaukee’s existing tools. All M18 batteries will still work with any M18 tool, but some of the battery compartments just aren’t big enough to hold the new battery. To solve this issue, Milwaukee announced that they will offer free service upgrades to customers who own the non-compatible tools and have bought the 12.0 battery. You can find the full list of the affected tools on our previous article by clicking here. Drill/Drivers, Hammer Drills, and Impact Drivers are the flagship item to any tool manufacturer’s battery platform, so they have to constantly improve on them to stay on top. 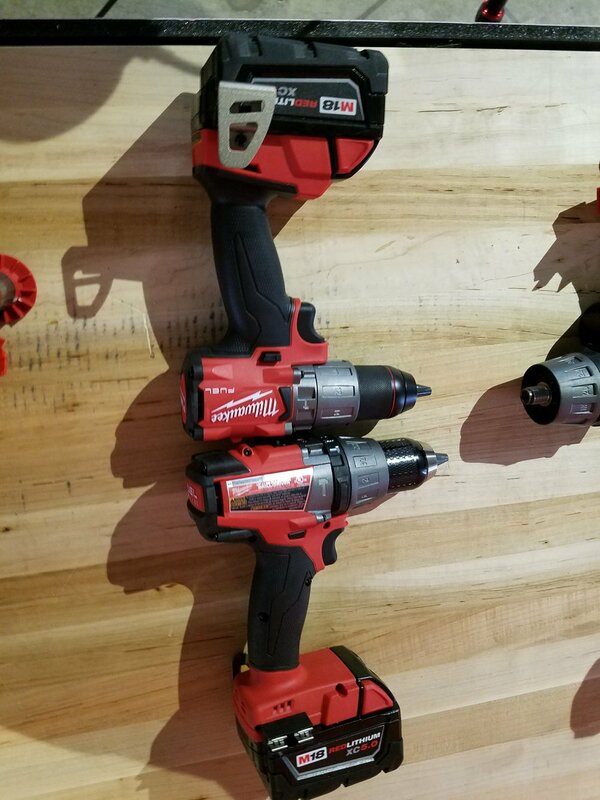 At NPS, Milwaukee announced the release of their 3rd generation models of all three tools, which are not only more powerful than ever, they’re also incredibly small. The ½” Drill/Driver (2803-20) and Hammer Drill (2804-22) are a little bit shorter in length than the previous generations, but they also have the added feature of a more durable black oxide jawed chuck. The ¼” Hex Impact Driver (2853-20) is incredibly small and powerful, coming in at ¾” shorter than the second generation model, delivering 0-3,600 RPM and 2,000in-lbs of torque. All three tools will launch in July and are available for preorder on ToolBarn.com. No matter how specific your construction trade may be, Milwaukee Tool is not going to ignore you. The company announced the release of several new Power Utility Solutions at the event, which they admitted will never sell at a high volume, but they still value that customer. Among the new tools for power utility workers are an M18 Force Logic 6T Jaw Expansion, more Lineman’s Shockwave accessories, power utility storage solutions, lineman’s pliers, and more. 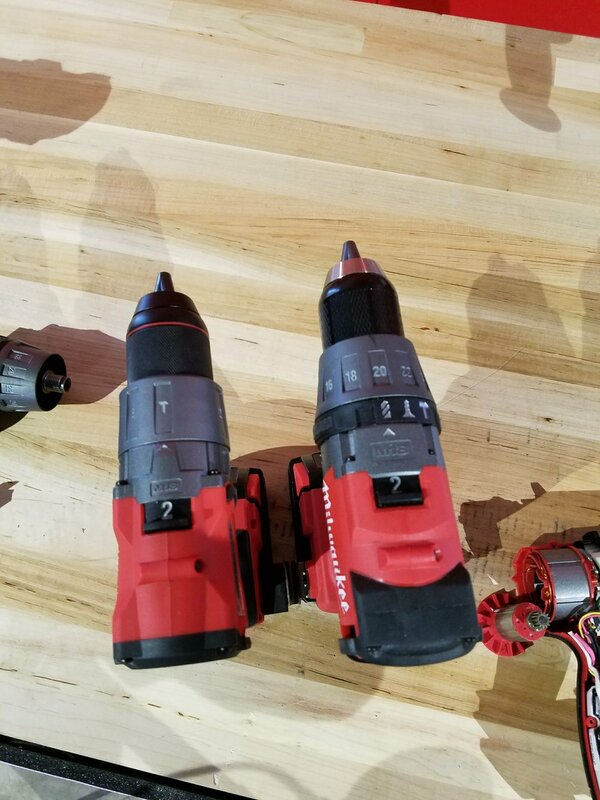 Milwaukee also announced several new carpentry tools, like a D-Handle jig saw and a barrel jig saw, a 3” cutoff tool, which had many at the show excited, several new levels, and a recently released M18 random orbit sander. For electricians, there were new conduit benders, new Shockwave Impact Duty Step Bits, and Copper/Aluminum Cutting Jaws for 600MCM Crimper. For plumbers and mechanical contractors, there was a large expansion of pipe wrenches and an extreme metal-cutting band saw blade. One of last year’s most popular releases was the tool storage solution called PACKOUT. Milwaukee has had trouble keeping the system on shelves over the past few months and many were excited at the thought of a PACKOUT expansion. There definitely will be an expansion to the system, but it won’t be until the 4th quarter at the earliest. A half width and full-width low profile organizer bins, which are exactly half the height of the original organizers. PACKOUT mounting plates for storage on the wall or floor of a shop, van, or truck. A flat dolly, capable of securely holding up to 250 pounds. The company representatives also told us that there will be 15 more new PACKOUT items in 2019, for those of you who were hoping for a drawer unit, a PACKOUT radio, or a compatible vacuum. They were quiet about what new accessories they were currently working on, but it’s clear that they have heard everyone’s opinions on what should be next. Milwaukee’s ever growing line of USB rechargeable, M12, and M18 lighting solutions will once again get much bigger in 2018, with the announcement of several new jobsite lighting solutions. The USB rechargeable line will see a new pivoting flashlight, which provides 500 lumens of light, and a Pivoting Flood Light, which delivers 550 lumens of light, a 210 degree pivoting head, and the ability to stick, stand, or clip to most surfaces for mounting. The M12 line will see an oft-requested Rocket Dual Power Tower Light, much like the existing M18 version. It will have the ability to run off of the M12 platform or plug into an outlet. Launching in October 2018, the light provides 1,400 lumens on high, extends to over 5 feet high, and sets up in about 5 seconds. The M18 line will see an upgrade to the very popular M18 Rocket Light, in that the new version, which launches in the 3rd Quarter, will have the ability to be powered by battery or by cord. Milwaukee has the industry’s most popular line of heated apparel and this year will see an expansion of that lineup. The M12 heated Toughshell jackets and hoodies will be able to produce heat up to 3 times faster with the new line. A new line of M12 Heated AXIS Jackets and Vests are super soft, highly compressible, but still made of the company’s Ripstop fabric for durability. The AXIS line will be available in men’s and women’s sizes and launch in August of 2018. The item that drew the most attention in the apparel section was the new Redlithium USB rechargeable heated work gloves. These are the first heated work gloves that I know of that were made specifically for the construction industry and I’m interested to see how they will be received. The gloves are large and bulky, lined with Ripstop polyester on the back and 100% leather on the palms and fingers. One battery charge will last up to 6 hours for each glove. The Milwaukee Tool NPS 2018 was another whirlwind of a day. There were so many new releases, it was hard to capture all of the details in just a few hours. I’ll have more coverage, with additional images and videos from the event on our Instagram page in the coming days, if you would like to follow along.